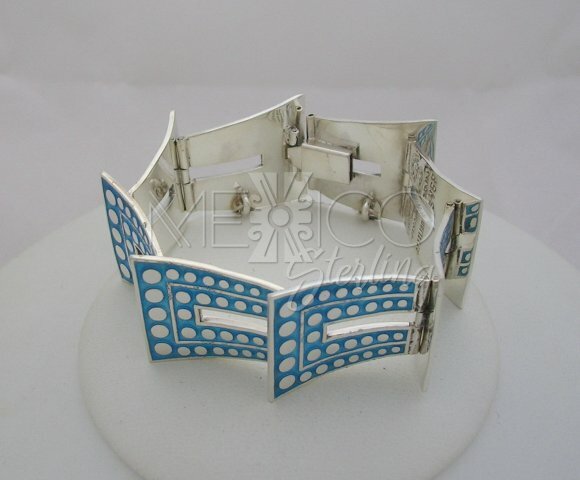 Taxco Sterling Silver and Enamel Bracelet Margot de Taxco - $371.00 : Mexico Sterling Silver Jewelry, Proundly from Mexico to the world. Dimensions: W: 1 1/8" Inside Circumference : 7 1/4"
We call this magnificent piece "The enamel pyramid" This is a gorgeous Margot de Taxco design, most of her designs carry a feminine, ethnic or monumental kind of look. On this case I think the last adjective is more proper to describe this geometric shape that gives life to one of a kind piece of jewelry. 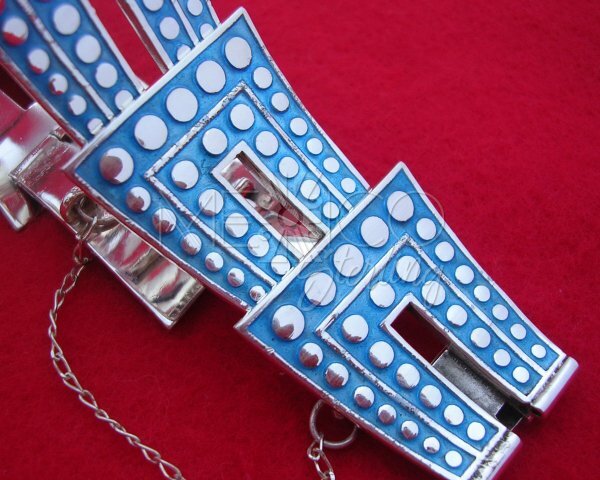 This silver and enamel bracelet was completely handmade by Sr. Melesio Rodriguez Villalba. He worked in Margot Van Voorhies Carr's workshop for more than 20 years. He uses the same molds and techniques used more than 30 years ago, in fact many of the vintage Margot's pieces on the market nowadays, might've been made by Sr. Melesio. He's 80 years old and he continues working and creating these artistic pieces of jewelry and keeping this Mexican tradition alive. His grandson Luis Melesio Villarreal Rodriguez has learned this craft and along with his grandfather keep working to get you these pieces of art. 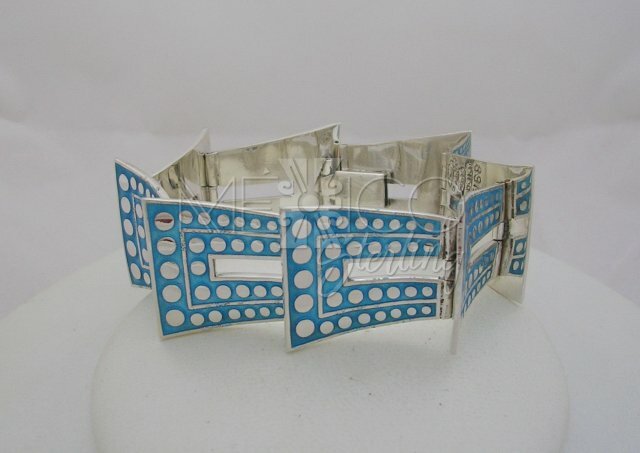 This Mexican sterling silver bracelet is complemented by a Turquoise blue enamel on the surface. 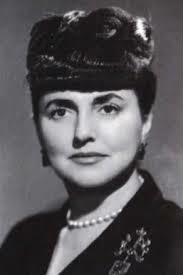 This feature is almost a signature for Margot's works. She used it heavily in so many designs. 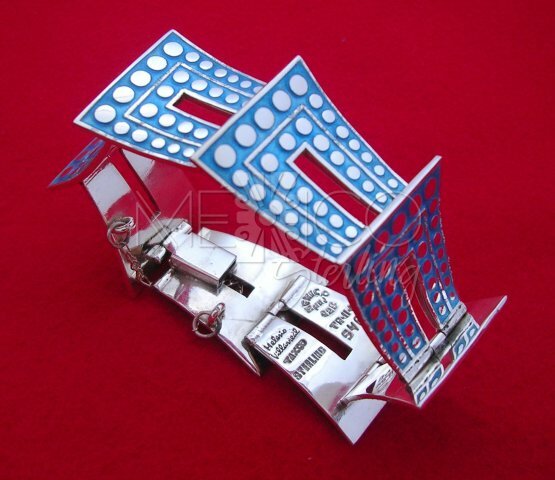 It is a classic design, by her, first introduced in the 1950's. Solid, bracelet with a total weight of 73.9 grams (2.3 ounces). 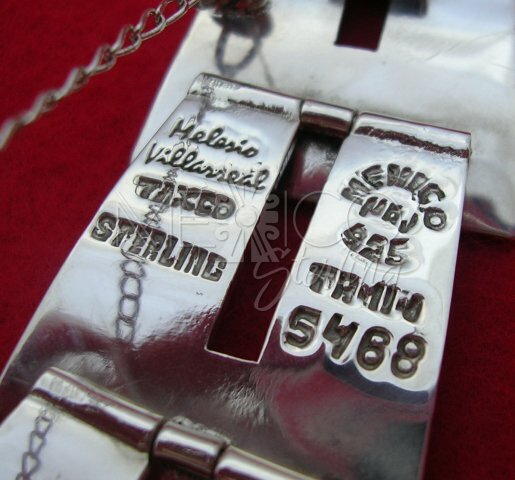 The bracelet carries the original mold's number "5468" as well as the more recent Melesio's hallmark. 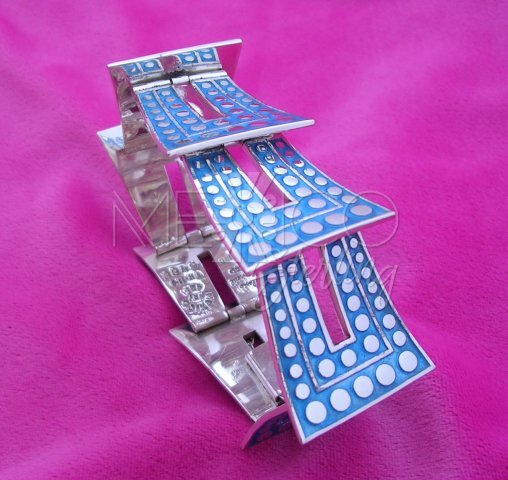 This bracelet is made with a "950" sterling silver Purity, better quality silver than the most common 925. If you need a larger inside circumference, please contact us, so we can help you.